Bloating is a common symptom of menopause and is an unpleasant experience, leaving some women feeling sluggish and self-conscious. An increase in flatulence often accompanies bloating, and this can be embarrassing and uncomfortable. Although bloating can happen at any age, it is even more common during menopause and may last longer. This can happen for many reasons, but one is that the hormonal imbalances of menopause cause the body to retain more water. Fortunately, there are things you can do to reduce bloating and even stop it completely. Bloating can be caused by what you eat, when you eat, and even how you eat it. Eating big portions quickly can lower digestive function, and so it is best to eat smaller portions more frequently. The habit of eating three times a day can be difficult to change, but will have noticeable benefits. Eating smaller meals throughout the day will reduce the urge to snack and lessen feelings of intense hunger or over-fullness. It is also helpful to chew your food more slowly and completely. 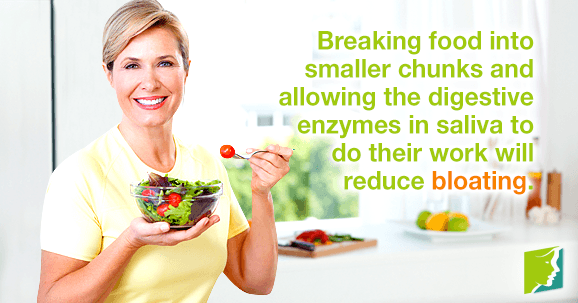 Digestion begins in the mouth, so breaking your food into smaller chunks and allowing the digestive enzymes in your saliva to do their work will reduce gas production in the body. Try reducing your consumption of certain foods that tend to cause bloating. These include beans, broccoli, onions, dairy, and cabbage. It could also be beneficial to cut out or reduce consumption of bread, as some women can be sensitive to gluten. Reducing salt in your diet is also helpful, as salt encourages the body to retain water. Getting blood pumping through your body will stimulate the digestive system and help it work more efficiently. It will also encourage any blocked gas to pass through the digestive tract. Bloating tends to occur more in people who lead sedentary lifestyles, so being more active is the first step to preventing it. Start walking, bicycling, or jogging to improve your digestive and cardiovascular system. Not getting enough water causes the body to go into "survival mode," and it will hold onto the water it already has. Water retention is the main reason for bloating, so drinking more water will help the flow of liquids through your system. This will only encourage you to swallow air, which is a big contributor to bloating. In addition, as most chewing gum contains many processed ingredients and sugar, it is also bad for oral health and is best avoided completely. Bloating is an unpleasant symptom of menopause and one that many women wish to avoid. However, it's a problem that can be dealt with. Making simple changes to lifestyle and diet can reduce the chances of bloating getting in your way during menopause. Bloating is a very common symptom of menopause. Fortunately, there easy ways to relieve it. Read on to discover them.